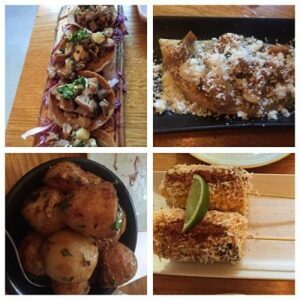 Mamasita Melbourne – 90% gluten free! 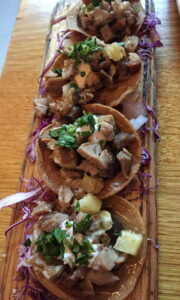 Mamasita is a very popular Mexican restaurant at the ‘Paris’ end of the Melbourne CBD, just down from Parliament. On their website they describe themselves as Melbourne’s first proper taqueria (ie taco shop), but it is a lot more than that! the menu is not 100% gluten free (as some reviewers have described), but in Mamasita’s own words “the majority of our menu is 100% gluten free”. I would describe it as 90% gluten free, so that makes it a pretty good place for a coeliac to visit! 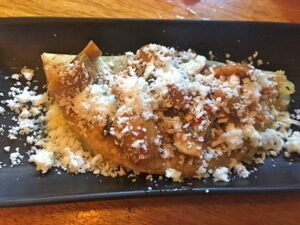 The restaurant has a buzzy, casual feel and usually has a mixture of groups and couples. Most of the dishes are designed to share, with a variety of tostadas, tacos, quesadillas as well as some salads and larger main meals. For most categories, there is at least one vegetarian option. 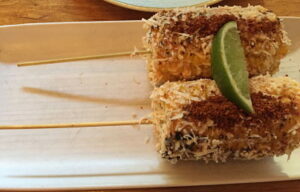 I think my favourite dish is the street style corn which has a dusting of cheese and chipotle mayo with lime. Yum, yum, yum! 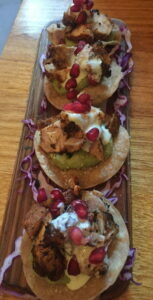 You get four tostadas (topped tortilla chips) per serve (from $12-15) and below is the blackened chicken and the duck. Both were tasty with a nice mix of flavours. 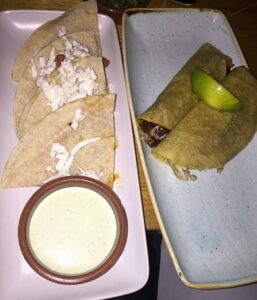 There are two quesadilla options, and my friend and I really enjoyed the cheese and mushroom one below ($6). 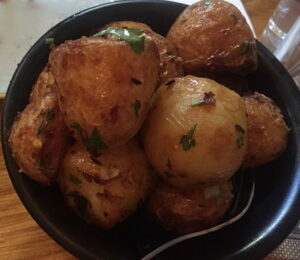 There are a variety of side dishes to choose from (I love the fried potatoes), as well as desserts. I haven’t tried the desserts, which include some ‘liquid’ alcoholic desserts! You can of course get a large variety of tequila and other drinks, and there is a bar you can sit at to wait for your table when you get to the front of the queue. Despite living in the UK for many years where queuing is a national pastime, I hate to queue and prefer to book somewhere and know I have a table. However, as Mamasita do good gluten free food I don’t mind a short wait, so I just make sure I go early and avoid the queues. You can also check the size of the queue on their webcam before you head over. As there is normally a queue down the stairs, obviously most Melburnians are happy to wait!